Tuner cars are typically very polarizing. Take anything from Mansory, Gemballa, or others, and the reactions will either be pure disgust or unabashed adoration. 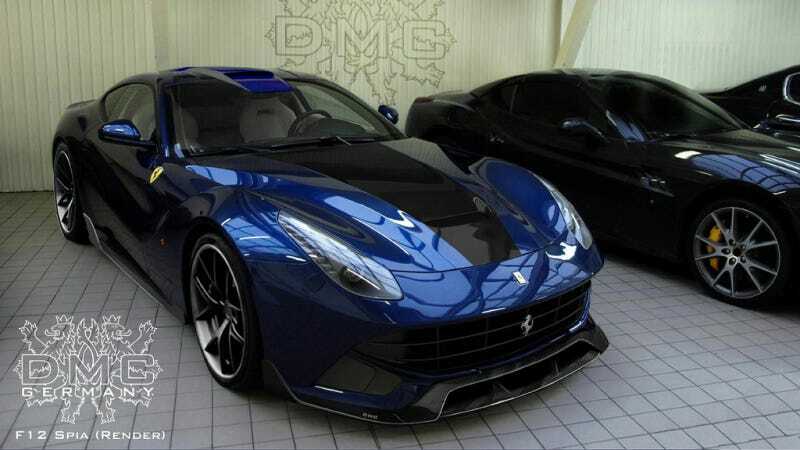 And then we come to this DMC-tuned Ferrari F12 "Spia." I can't tell if I love it or hate it. I'm confused. The German tuning house typically modifies Lamborghinis, but they couldn't resist the latest V12 Ferrari. Power is up 23 over the standard car thanks to a tuned exhaust. That means that this is mainly a body kit and appearance package. But then we come to the body. The car is decked out in a deep blue, "murdered out" tail lights, 22-inch rims, and a full on body kit that includes a carbon fiber rear wing, carbon fiber diffusers, carbon fiber side skirts, and probably many other things made out of carbon fiber. I loved the Spia as soon as I saw it. I really did. But then I looked again about two minutes later and wanted to vomit. I don't know what it is that elicits that reaction either. Maybe it's the front splitter? Maybe I need to get my eyes checked? Maybe I'm disgusted with myself for liking a gaudy tuner car? DMC hasn't actually built one yet either. These are renders of what the Spia will look like when someone actually plunks down their dinero for one of these modified bad boys. I don't know if I'm happy or sad that this car doesn't actually exist right now. I guess we'll never know because I'm too lazy to look into my psyche and find out.